Football season is now in full swing—what have you been eating on game days? If you’re like many Americans, you think of chips and dip, veggie platters, and greasy takeout food as football food. Why not prepare something truly splendid on Sundays instead? Whether your team is making you proud by returning kickoffs for TDs or shaming you by missing easy field goals, your taste buds will declare the day a win with a few of these homemade dishes. You should start with chicken wings and beer brats of course, but why stop there? How about smoked oysters, followed by prime rib or grilled pizza, and finger foods like smoked pecans and deviled eggs? And do it with style. With sleek equipment like the 2016 Memphis Pro, you will be able to wheel the pellet smoker to your ideal TV-watching spot and not miss a second of the game. 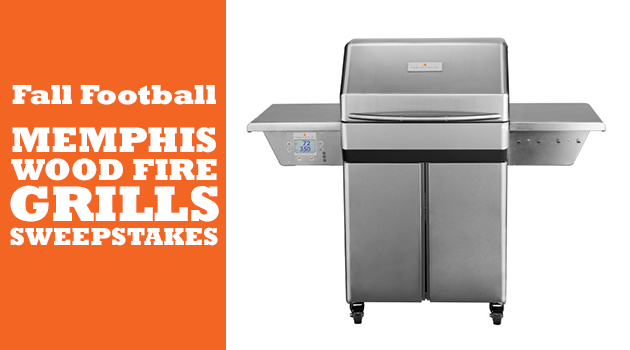 Our friends at Memphis Wood Fire Grills have partnered with us to make a certain reader VERY happy—enter below for a chance to win your own Memphis Pro this fall! The Memphis Pro pellet grill ($3,299 MSRP) would be an asset to any griller’s home—use it to sear at high temps, smoke at low temps, roast/bake with convection cooking and add wood fired flavor at the touch of a button. Sound good? Use your email address or log in with Facebook to complete your entry. NO PURCHASE NECESSARY. Open to US residents of the 48 Continental United States, age 18 years as of November 25, 2016. Sweepstakes begins at 12:00 a.m. Eastern Time (ET) on 10/25/2016 and ends at 11:59 p.m. ET on 11/25/2016. Click here for official rules. Void where prohibited. Be sure to share your football grilling accomplishments with us on Facebook and Twitter!